Ricochet and Away! : My Retro Pillow is Done! My Retro Pillow is Done! This has been a busy month for me with the kids going back to school, a bathroom remodel, 7 fish purses to sew, 2 weddings, a 10 year anniversary to celebrate, painting the kids' bedrooms, and prepping for a visit from my lovely in-laws. And to top it all off, I had to create a pillow cover for the Retro Pillow Challenge! Honestly, the pillow challenge has been my favorite task this month. Keren and I are eager to come up with a new challenge for November. Any suggestions as to a theme or project? So here it is, my retro pillow. I've never done patchwork before and I'm proud of how my squares lined up perfectly. I've never quilted before and I'm eager to try making some quilted tote bags in the future. This project went pretty smoothly and, all in all, didn't take much time to complete--all together maybe 4-5 hours. I feel like most of that time went towards choosing the fabrics! Here's the finished pillow front. 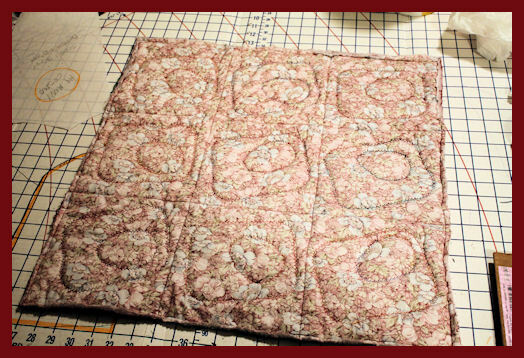 I washed it to fluff up the quilting and fray the raw edges. I'm thinking those green squares with the red circles in side are looking like olives! The challenge guidelines called for the use of rectangles with rounded corners or circles. I figured I better have all my bases covered! 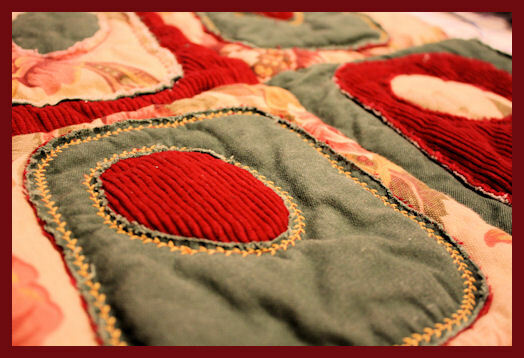 Flip over my pillow front and you can see my machine quilting. I only quilted along the seams. A closer look at how I put together each square. I stacked the 3 layers of fabric. I stitched the square and the circle. Around the square, I cut off the top 2 layers of fabric. Inside the circle, I cut off the top layer of fabric. 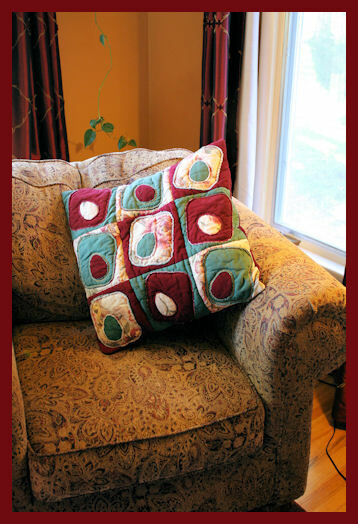 I sewed the completed squares together to form the pillow front. I made a sandwich of my pillow front, some batting and large piece of backing fabric. 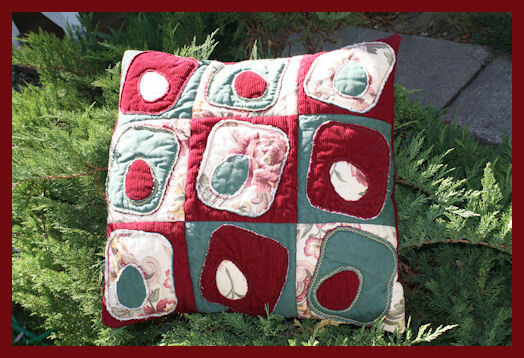 I used a decorative machine stitch to quilt around all the squares and circles. 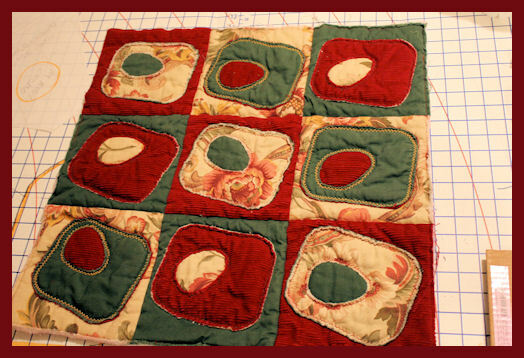 I used a straight stitch to quilt along all the patchwork squares. Then I sewed on the envelope style back. Easy-peasy! Lucy the Cat certainly loves her new pillow! Stay tuned for the voting portion of this challenge coming up in October. As Always, happy crafting and big hugs from Montana! Great!! I love the floral fabric you used. And what a cute kitty. Oh my goodness! How can one person do so much in so little time? What a great job!! I love the pillow!!! Your retro pillow is fabulous: shape, colours, textures. It all works well. Count me in for November's challenge... Christmas theme, a bag??? I'm sure you'll both come up with something that's both challenging and fun. Perhaps next time I'll do the reverse appliqué I didn't do this time??? 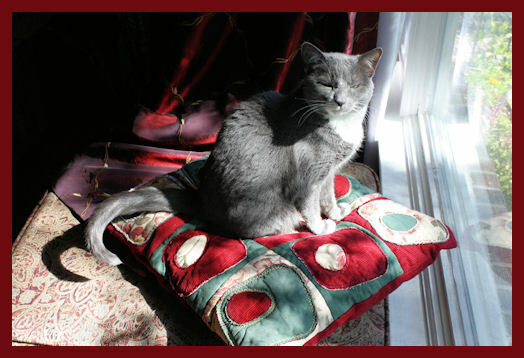 Now that is one terrific pillow and what a lucky cat. Vote for your Favorite Retro Pillow! 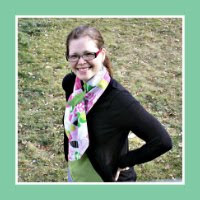 Please check out my first guest post! The Retro Pillow Challenge Begins!